Kansas Brussels Griffon Rescue View other Brussels Griffons for adoption. 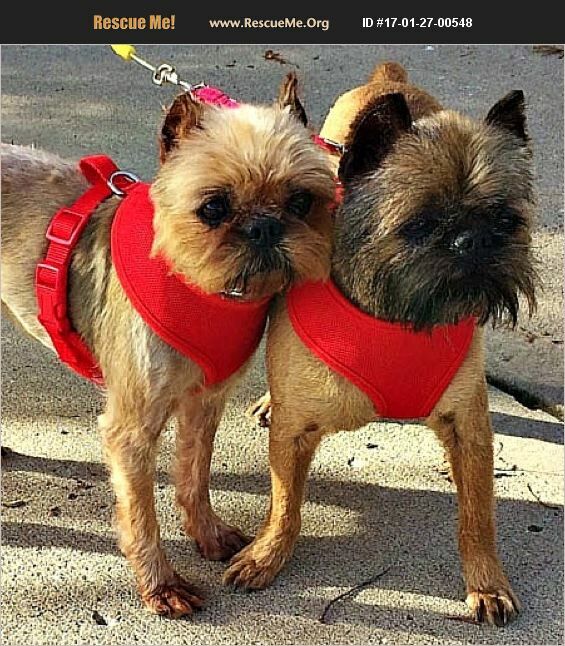 LEVI and MILEY ARE A BONDED PAIR AND MUST BE PLACED IN THE SAME ADOPTIVE HOME. MILEY IS VERY FEARFUL AND WILL REQUIRE A VERY DOG SAVVY HOME. Levi and Miley are childhood sweethearts who met and fell in love at the tender age of just 10 weeks old. They have been two peas in a pod ever since! After sharing their lives for 8 years, they continue to be as crazy in love with each other as the first day they met, and are looking forward to many more happy years together! Levi (belge rough coat) is a handsome take charge kind of guy with a very loving, endearing tender side, and the more out going of the two, while Miley (red rough coat) is a strikingly gorgeous, yet very shy, sweet little thing who shadows Levi's every move, and is always devotedly by his side. Both are at perfect well toned healthy weights: Levi at 14.9 lbs, and Miley at 12.10 lbs. They enjoy daily walks, exploring outdoors in a securely fenced yard, cuddling on the couch, and sleeping in the big bed at night in a calm adult only home. If touching love stories melt your heart, then sharing your life with this adorable little Griffy duo who still look and act like newlyweds is guaranteed to put a smile on your face and a song in your heart each and every day! Levi and Miley are neutered/spayed, vaccinations are up to date, had recent dentals, are heart worm negative, on monthly heart worm preventative, and micro chipped. We never place dogs in homes reliant on electric or invisible fencing to contain pets. Fencing of this type may or may not keep a dog in the yard, nor does this type of fencing protect pets from predators, free roaming dogs, or people who may enter the yard. Should there be a power outage, the fence would be rendered useless. If a pet were to panic and run through the barrier and take an electrical jolt from the fence, that pet would not be inclined to return home, and could be lost forever. We always give preference to adoption applications from families who live within reasonable driving distance of where the dog is being fostered because if for any reason the placement does not work out, it is less stressful for the Griff to be returned to the foster family that dog has previously bonded with. However, if an applicant from outside the area is approved to adopt, they must drive to where the dog is located or fly. If flying the Griff must fly in the cabin of the plane with his/her new family. We never ship our rescued Griffs, or allow them to fly via cargo.